Nancy Large, a clinical pharmacist at 65-bed Sonoma Valley Hospital, does daily “rounds” with Dr. Javeed Siddiqui to review all antibiotics ordered during the past 24 hours as part of the hospital's telemedicine-based antimicrobial stewardship program. Antibiotic resistance is a threat to national security. That's how President Barack Obama described the rapid growth of such resistance when he issued an executive order in September instructing HHS and the Defense and Agriculture departments to take aggressive action on the issue. The president cited federal data showing that at least 2 million Americans are infected with drug-resistant bacteria each year and 23,000 die as a result. He emphasized the critical need for improved antibiotic stewardship—coordinated practices promoting the appropriate use of antibiotics—in healthcare facilities. Federal officials say such programs are among the most effective ways to curb resistance and reduce the number of hard- or impossible-to-treat infections. A growing number of hospitals are instituting stewardship programs, which experts say not only improve patient outcomes, but also reduce costs and lengths of stay and lower antibiotic-resistance rates within hospitals. Those efforts have been bolstered by looming federal action that would make the inclusion of a stewardship program a requirement to participate in Medicare. But many hospitals—especially smaller, community facilities—face tough challenges, often related to inadequate staffing and resources. Increasingly, however, those hospitals are using telemedicine, local partnerships and other creative strategies to push stewardship forward. Intermountain Healthcare is conducting a 15-hospital study on running stewardship programs in smaller hospitals. Kenmore Mercy Hospital, a 155-bed facility in Buffalo, N.Y., is collaborating with independent physicians in its accountable care organization to educate its staff on antibiotic best practices. Other smaller hospitals in California and Minnesota have contracted with infectious-disease, or ID, specialists to lead their programs. Stewardship initiatives vary widely. But in a March report, the CDC listed the core elements for such programs, which include a commitment from senior leadership, tracking and reporting of antibiotic prescribing patterns and resistance, clinician education and the appointment of a single person to lead the effort. Stewardship programs, the CDC recommended, should implement at least one intervention, such as prior authorization for certain restricted antibiotics, antibiotic dose optimization, or prospective audit and feedback. The last involves someone outside the treating team reviewing antibiotic orders and cultures and advising clinicians on recommended changes. In addition to improving patient outcomes, stewardship programs save money, in most cases more than paying for themselves, Srinivasan said. According to data cited by the CDC and the Infectious Diseases Society of America, a comprehensive antibiotic stewardship program can reduce antibiotic use by 22% to 36%, with annual savings of $200,000 to $900,000. “It's a win across the board,” Srinivasan said. Officials estimate that roughly half of the nation's hospitals have some kind of antibiotic stewardship program. But little is known about how robust those programs are and their interventions. “We need better data,” Srinivasan said. The CDC is planning in 2015 to add several questions about stewardship to its annual survey, distributed to the more than 4,000 hospitals that report healthcare-associated infection data to the CDC's National Healthcare Safety Network. Dr. Shari Ling, deputy chief medical officer in the CMS' Center for Clinical Standards and Quality, confirmed that the agency plans to propose a condition of participation for antibiotic stewardship in 2015, with an implementation window in 2017. Currently, California is the only state that mandates that hospitals have stewardship programs. The challenge for the CMS, Ling said, will be ensuring that the new rules allow for differences in hospital size and resources. “The condition of participation has to permit flexibility so that all facilities can engage in a way that's meaningful for them,” she said. Large academic medical centers, for instance, usually have specialized infectious-disease doctors and pharmacists who can guide stewardship programs, while smaller hospitals rarely do. And smaller hospitals often lack the money and IT infrastructure that larger facilities can use to boost their efforts. Smaller hospitals look to telemedicine and partnerships with infectious- disease experts to establish best practices on appropriate use of antibiotics. Stenehjem and his colleagues are trying to find out. They are in the midst of a 15-month randomized trial, launched in March 2014, that includes 15 Intermountain community hospitals, some with fewer than 20 beds. Each hospital was assigned to one of three groups, receiving a high-, medium- or low-level antibiotic stewardship program. The low-level group received a set of stewardship best practices, antibiotic usage data and training for the hospitals' pharmacists. In contrast, hospitals in the high-level group received best practices and usage data, a more robust curriculum, monitoring of antibiotic restrictions by an off-site infectious-disease pharmacist and review of each culture by an off-site infectious-disease physician. Stenehjem said he hopes the study, scheduled to end in June, will shed light on the needs of smaller hospitals and which stewardship initiatives work best for them. Riverton (Utah) Hospital, a 92-bed facility, is in the high-level group in Stenehjem's study. The hospital had no formal stewardship program before the study, said Jennie Barlow, a clinical pharmacist. But 10 months in, the hospital's pharmacists and physicians now rely on support from Stenehjem and his colleagues. “I hope the study shows that the high-level approach is the one that works best, because it's great to have the extra help,” she said. Hospitals that don't have outside help, though, still can make progress, Snow said. She advised starting small with “low-hanging fruit,” such as intravenous-to-oral conversions, when IV antibiotics are switched to their oral version. That's a change that reduces the risk of infection, improves patients' mobility and lowers costs. Antibiotic timeouts—when antibiotics are reviewed after 48 hours to assess whether they are being appropriately used and whether they are still necessary—are also relatively easy to implement, she said. Kenmore Mercy Hospital in Buffalo had several of those stewardship components in place but had never pulled them together into a formal program, said James Bartlett, the hospital's lead clinical pharmacist. Then in 2012, its parent, Buffalo-based Catholic Health System, was recognized as an ACO under the Medicare Shared Savings Program, which provided financial incentives to collaborate and improve outcomes. “All of a sudden, we had all these different groups in our ACO that were looking for ways to optimize care,” Bartlett said. During the first year, the program saved more than $145,000 on drug purchasing alone, he said. Pharmacist-initiated IV-to-oral conversions increased 688%, compared with the previous year. And physicians accepted the recommendations of infectious-disease physicians nearly three-quarters of the time. Like Stenehjem, Bartlett noticed the dearth of research about antibiotic stewardship programs at community hospitals. He and a colleague wrote an article describing their experience designing an antimicrobial stewardship program, which was published in June in the American Journal of Health-System Pharmacy. Bartlett acknowledged that Kenmore Mercy's program would have been harder to implement without the help of its parent health system and the other members of its ACO. “Without that support, our program would not look the way it looks now,” he said. One option for small, stand-alone hospitals looking to implement stewardship programs is telemedicine, said Dr. Javeed Siddiqui, founder and chief medical officer of TeleMed2U, a Roseville, Calif.-based company that offers a telemedicine-based antimicrobial stewardship program. His company provides stewardship services for three California hospitals, including 65-bed Sonoma (Calif.) Valley Hospital and 48-bed Ukiah (Calif.) Valley Medical Center. 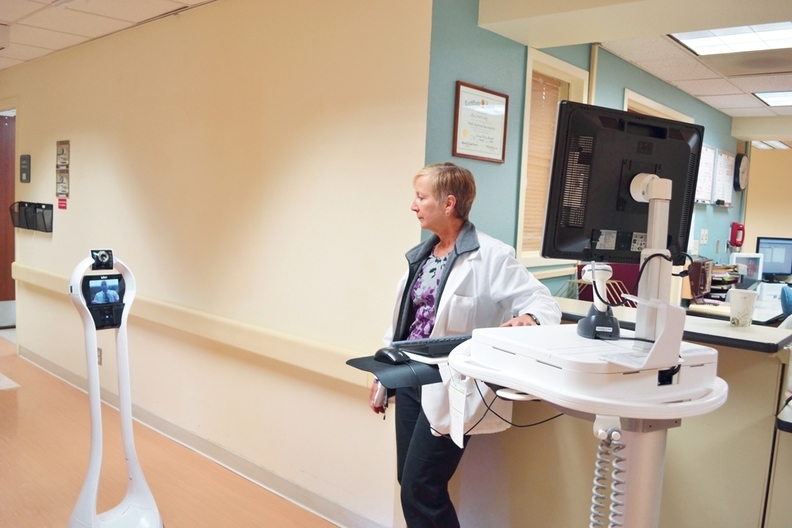 California hospitals are especially motivated to try telemedicine, he said, because state law requires that hospitals have antibiotic stewardship programs. Since its program began, Sonoma Valley Hospital has seen its use of flouroquinolones and piperacillin/tazobactam—two categories of broad-spectrum antibiotics—drop by 80% and 70%, respectively, Siddiqui said. The hospital's resistance rates also dropped. Despite the evidence of the benefits of stewardship, Siddiqui has encountered pushback from a few physicians. “There are still some physicians at Sonoma who don't want my input, but I think we have about 90% of them on board and I'll take that any day,” he said. The CDC's Srinivasan pointed to another antibiotic stewardship model that might work for community hospitals. Dr. Gary Kravitz, an infectious-disease specialist with St. Paul (Minn.) Infectious Disease Associates, runs stewardship programs at five local hospitals, including 192-bed St. John's Hospital and 232-bed St. Joseph's Hospital, both in St. Paul, and 86-bed Woodwinds Health Campus, Woodbury, Minn. He started in 2002 by developing a stewardship program for 398-bed United Hospital in St. Paul, where he was on staff. “I think we were getting paid about $50,000 to do the program and the hospital saved that much just on pharmacy costs in the first year,” he said. His results were so strong that over the next few years, he took the business proposition to other hospitals, negotiating renewable contracts to design and oversee stewardship programs.